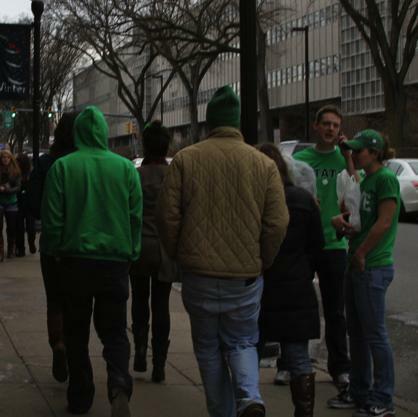 Revelers sported green clothes Saturday for State Patty's Day in State College. Photo by Patricia Collins. 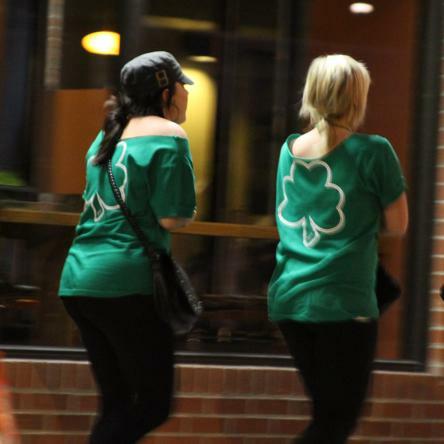 The final figures had yet to be tallied and released Sunday evening, but indications appear to suggest State Patty's Day 2011 was the busiest yet for emergency responders in State College. From midday Saturday to midday Sunday, borough police handled 189 calls, according to a police log. In the prior 24-or-so-hour period, police had received about 110 calls. Many involved alcohol-related issues, such as open-container violations, public urination, fights and other disorderly conduct. But those numbers probably won't reflect the entire incident tallies from those periods, police said, as delayed reports of earlier misbehavior continued to arrive Sunday afternoon. "I know that it was very busy," borough police Lt. Bradley Smail said in a Sunday-afternoon press briefing. Despite the closures of a variety of bars, he said, downtown State College remained very busy throughout Saturday. He confirmed that one of the establishments that closed unexpected Saturday night -- the Indigo nightclub -- did so voluntarily. "They had such a huge line," Smail said. " ... They were at max capacity." The aftereffects of the student-founded drinking holiday, in its fifth year, lingered into Sunday, as heavy traffic caused congestion downtown and on Atherton Street. "My impression," Smail said, "is that there was quite a bit" of misbehavior involving out-of-town visitors. A count of State Patty's Day incidents involving visitors to the region had yet to be completed late Sunday. But "let's be honest," Smail said in the briefing. "Many of them (the visitors) are coming to visit their Penn State friends." Three men said they were assaulted at 320 E. Beaver Ave. about 6:30 p.m. Saturday. They said they'd been accused of using a racial slur and were attacked by a group of 15 to 20 people, according to a police report. An unidentified man, apparently upset over his Taco Bell order, kicked the front door at the restaurant, 322 W. College Ave., police said. He broke the door's glass in the process, then fled the scene, according to a police report. As of Sunday afternoon, he had not been caught. A man ended up at Mount Nittany Medical Center with a broken nose after he tried to break up a fight on West Foster Avenue, police said. That happened about 6 p.m. Saturday, police said. An intoxicated man stole people's food and refused to leave at Jimmy John's on the 400 block of East College Avenue, according to a police report. That happened shortly before 6 p.m. Saturday, police said. A female reported she'd been punched in the face by a friend about 5:15 p.m. Saturday. That happened on the 600 block of South Allen Street, police said. A man was found urinating against a building on the 200 block of East Calder Way, police said. It happened at 4:10 p.m. Saturday, according to a police report. Ice reportedly was thrown from a second-floor apartment window at 138 E. Beaver Ave. about 3:56 p.m. Saturday, police said. People there were warned, according to a police report. A dog bit a woman in the face at the Beta Sigma Beta fraternity house, 255 E. Fairmount Ave., according to a police report. It happened Friday night but wasn't reported until Saturday, police said. The woman was taken to Mount Nittany Medical Center and received 40 stitches, police said. An investigation is continuing. A fight broke out at a house party about 2:50 p.m. Saturday on the 200 block of South Burrowes Street, police said. A man was cited for disorderly conduct there. An out-of-town visitor was caught pouring ginger ale off a balcony at Penn Tower, 255 E. Beaver Ave., and onto pedestrians below, police said. That happened at 2:34 p.m. Saturday, according to a police report. A man was cited for public drunkenness at 1:25 p.m. Saturday after he staggered across the street in front of a police patrol vehicle, police said. It happened on the 100 block of West Foster Avenue, according to a police report. A man was caught for retail theft after he took two hats from the McLanahan's store at 414 E. College Ave., according to a police report. It happened at 11:08 a.m. Saturday, according to the report. A man reported a group of unknown people in his residence at 2:29 a.m. Sunday, police said. It happened on the 500 block of South Pugh Street, but police did not find the reported intruders upon arrival at the residence, according to a police report. A Penn State student from another campus waved down an ambulance at 1:57 a.m. at Old Boalsburg Road and McCormick Avenue, police said. She said she had been assaulted, and had a bloody mouth with loose or missing teeth, according to a police report. She was taken to Mount Nittany Medical Center for treatment. Several people were cited for disorderly conduct after a fight about 1:20 a.m. Sunday on the 100 block of North Barnard Street. Someone -- or multiple people -- smashed the elevator lights and pulled the fire alarm about 11:30 p.m. Saturday in the apartment building at 215 W. Fairmount Ave., police said. As of Sunday afternoon, no one had been caught. A West Virginia University student was arrested for DUI about 9:30 p.m. Saturday at Hetzel Street and East Prospect Avenue. He refused a blood test, police said. A 300-pound log was thrown though a window and onto a roof at 235 S. Buckhout St., police said. The roof was badly damaged, according to a police report. It's unclear when the damage happened, but it was reported about 9 a.m. Sunday. Meanwhile, community-service-oriented alternatives to State Patty's Day revelry gained traction this weekend. More than 500 people -- including Penn State students and permanent State College residents -- turned out to participate in an inaugural, daylong community-walk effort. It was supported by the borough government, Penn State fraternity and sorority leaders and the Off-Campus Student Union. The idea was to bring a calming, helpful presence -- and sets of eyes -- to the downtown, and to encourage locals not to relinquish the town to drunken mayhem, organizers said. Pairs of volunteers walked through and around the downtown during two-hour shifts. In addition, dozens of Penn State students participated in "State Service Day," a new community-service effort that coincided with State Patty's Day. Volunteers did work on a variety of fronts, including in a local retirement community and in the community walk. StateCollege.com will post additional details Monday about those community-outreach efforts. Earlier coverage is posted below. It was, in short, a dramatic day. The State Patty's Day 2011 drinking holiday brought thousands of people to downtown State College on Saturday, flooding sidewalks, streets, parking garages and the relatively few bars that maintained regular -- or close to regular -- hours.